Soon we’re going to have to move the toys off the top shelf to give the books more space. The The Pout-Pout Fish by Deborah Diesen, pictures by Dan Hanna: This is the MOST fun to read out loud. Remember when Ludacris rapped Llama Llama Red Pajama ? (If not, check it out HERE) That’s an amazing book and a super fun rap, but I’d love to see what a rapper would do with The Pout-Pout Fish (specifically, I’d like to hear what Lin-Manuel Miranda would do with The Pout-Pout Fish) – it’s got creative vocabulary and great rhythm. “Kaleidoscope of mope” is practically a Shakespearean insult. 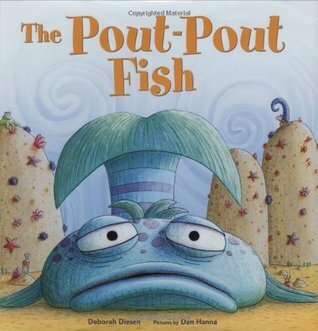 I’ve seen all kinds of statistics that say kids should be exposed to a certain number of words by a certain age, and I can’t help but think The Pout-Pout Fish should be on every kid’s book shelf simply because the vocab is such a treat. I Love You, Stinky Face by Lisa McCourt, Illustrated by Cyd Moore: If you’re familiar with the old standards, this book’s structure is very similar to the classic The Runaway Bunny by Margaret Wise Brown (of Goodnight Moon fame, natch). A little kid being tucked into bed asks his mother if she’d still love him under a number of rather outlandish circumstances, namely if he were a skunk so stinky that his name was “Stinky Face.” I’m rather prone to using such nicknames as terms of endearment (my poor son is often called “Stinky Pete” or “Grumpy Gus” depending on his mood or the state of his diaper) so I found the book’s title especially appealing. Plus, it gives me the opportunity to do different voices for the mother and son. It’s just plain fun to read. 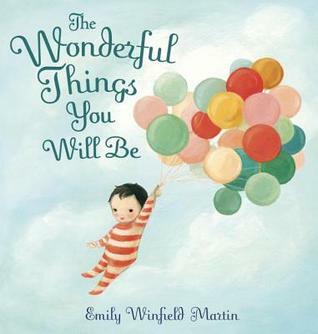 The Wonderful Things You Will Be by Emily Winfield Martin: This book will hit you right in the parenting/aunting/caregiving feels, a la Oh, the Places You’ll Go! The illustrations are beautiful and the message is so, so sweet. “When you were too small/ To tell me hello,/ I knew you were someone/ I wanted to know.” Just pass me the box of tissues, okay? This book is an awesome choice for a baby shower gift or a graduation present. Our copy came from one of our showers, and I’m going to have to go back and check the inscription to see who sent it so I can send another thank you note. Because reasons. This is just a tiny sample of the many excellent books on our shelves, but they’ve been in heavy rotation for bedtime stories of late. What are some of your favorite children’s books, Bookworms? This dude is always interested in new recommendations! One of Sam’s daycare teachers took this picture and I can’t get over it. HOW DID I PRODUCE THIS PERFECT CREATURE?! I am taking note here. I have two friends who are pregnant and a godchild who is graduating college this summer/fall. I need all the book recommendations that are different from what everyone else always buys. The Wonderful Things You Will Be is going to be my go-to graduation gift. Oh The Places You’ll Go! is wonderful, but odds are good someone else will have the same idea, you know? Also, that picture slays me every. single. time. Those eyes! Those lashes! Those cheeks! Right? I mean, I know I’m his mother so OBVIOUSLY I think he’s the most gorgeous human ever but that is an objectively excellent photo. 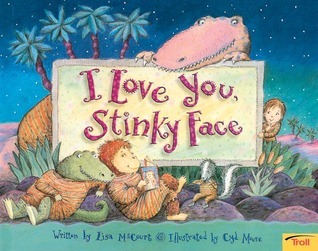 I Love You, Stinky Face was one of my favorites to read to the twins when they were small. They turned 15 yesterday. This hit me right in the feels. I’m gonna go cry now. 15? Oh man. Every time we have “one of those days” (which isn’t too often, we’ve been VERY lucky with Sam’s temperament) I remind myself that I’m going to wake up one day and he’ll be a walking talking person. One in heavy rotation at our house is Giraffes Can’t Dance. I love it! It flows nicely (except for one weird page where violin and thing are supposed to rhyme) and also has a nice message that will hopefully sink in. BTW, I can currently read it with my eyes shut. 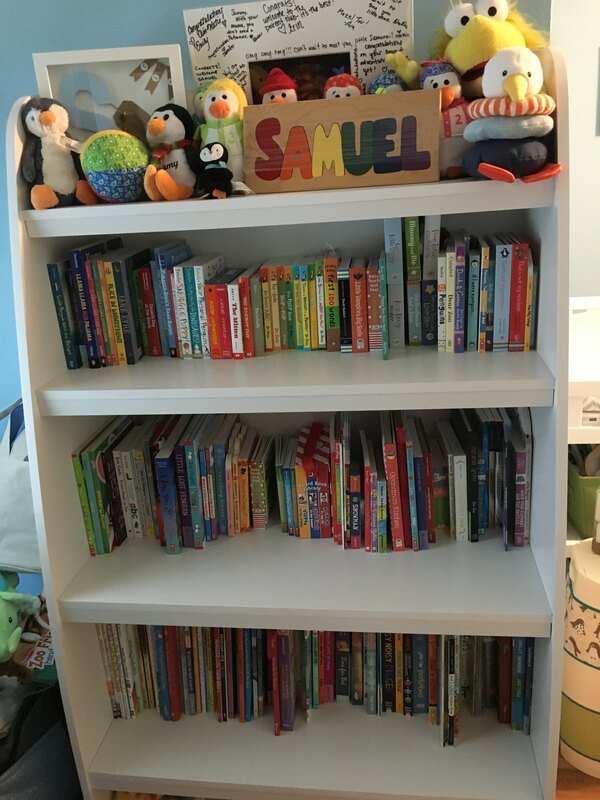 I remember Emma getting a copy of Giraffes Can’t Dance (Emma being Sammy’s cousin, I forget that not everyone is related to us). I’d be surprised if Grandma doesn’t have a copy of that squirreled away somewhere that will mysteriously turn up in our bags during a visit. I just love, love, love Pete the Cat. I want all the Pete the Cat books for me!! Especially the storybooks, before you get to the readers. I also love The Farmer by Mark Ludy. And The Secret Life of Squirrels by Nancy Rose. I second Pete the Cat! We even had a Pete the Cat 2yr bday party because my son loved the books so much. We have several Pete the Cat books, but most of them are soft cover young reader versions. We do have one hard cover (I think from you!) that’s really fun, but since it’s about dancing I think it’ll be even more fun when he’s a toddler and we can act out the moves! Pete The Cat’s, I Love My White Shoes is my favorite! 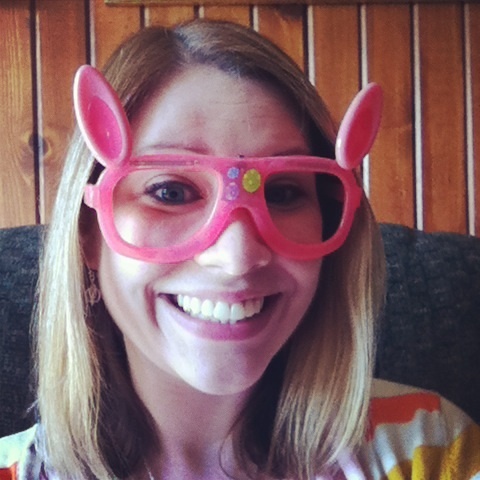 And I just recently picked up Pete the Cat and his Magic Sunglasses. He’s just always groovy. OMG that is hilarious. It’s a ballad which I was totally not expecting! I think I’d prefer it as a rap, but I love that someone actually made a song of it. I applaud their creativity. And earnestness regarding the plight of the Pout-Pout Fish. I LOVE the Pout Pout Fish!! Do you have the Pout Pout Fish and the Deep Deep Dark? I also found the Pout Pout Fish going to school book to be helpful. We had a Beta named Miss Shimmer for a while at our house. Love love. A library find that we love is Franklin’s Big Dreams. Also you must look up Lady Pancake and Sir French Toast. We have an Easter Pout-Pout Fish, but that’s it other than the original. Might have to add a few more to the birthday list because I cannot get enough Pout-Pout! I’ve added at least two of these books to my TBR. I am a fan of “I Like Myself’ by Karen Beaumont. Your son is adorable. What a wonderful picture. Ah, thanks for this post, I have heard of any of these books and they sound great! One of my favorites to read to my 12 month old is Barnyard Dance by Sandra Boynton. The rhythm is also very fun. I like the book Dinosaur vs Bedtime by Bob Shea, because it’s just really funny for an adult. At least, I really appreciate it’s humor. I love Sandra Boynton! Your Personal Penguin is (no surprise) also in heavy rotation, as is Snuggle Puppy. I personally love dinosaurs (my poor kid- if he’s not wearing penguin clothes, it’s dinosaurs) so I’m all about this Dinosaur vs. Bedtime- I’ll be looking that up! 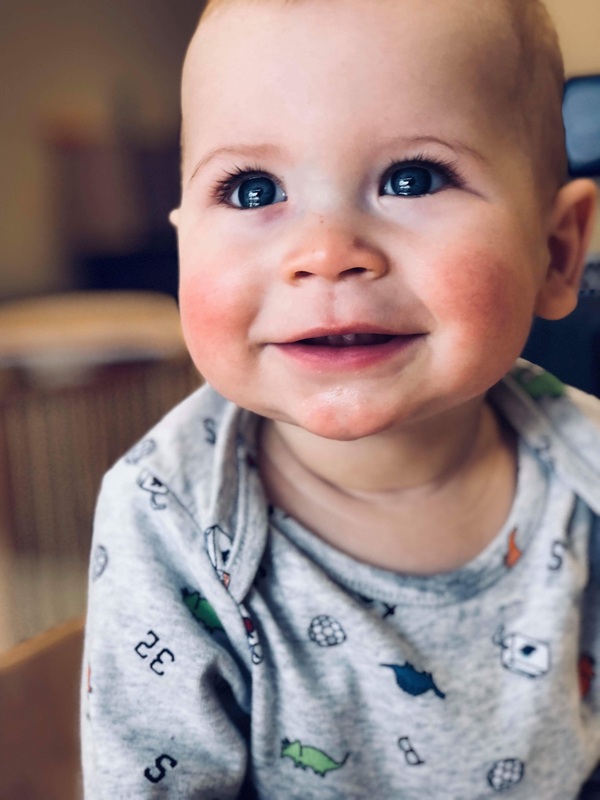 Well, Sam just remains THE CUTEST — his beautiful smile looks exactly like yours! And I’m going to have a look around for The Pout-Pout Fish. Even if my nephew is too old for it now, my sister does still plan to have another peanut one of these days, and that kid can enjoy the pout-pout adventures. Oh, no, Nephew will not be too old for Pout-Pout! It definitely bridges into preschooler territory.